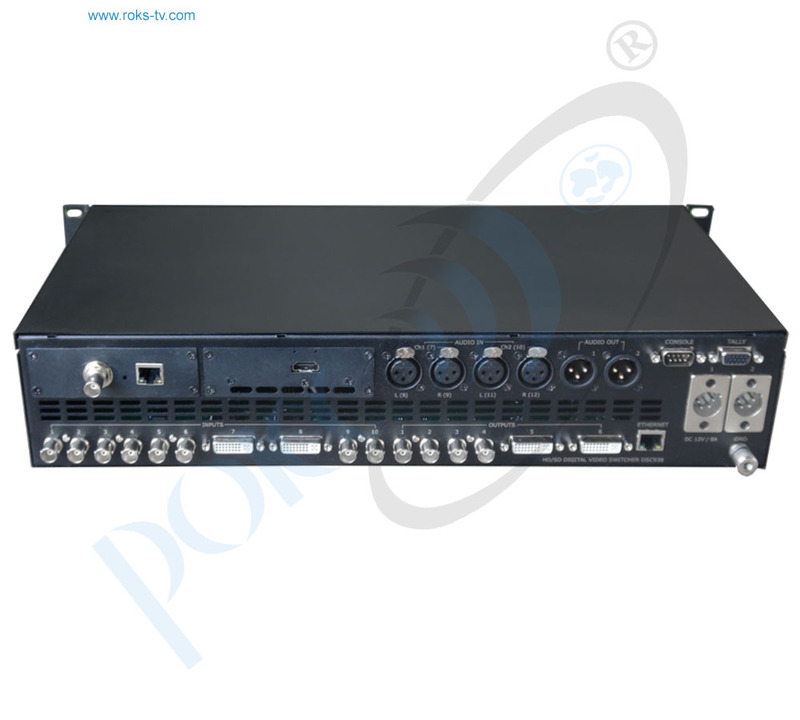 Video Mixer / Switcher HD is universal vision production switcher with wide range of applications. 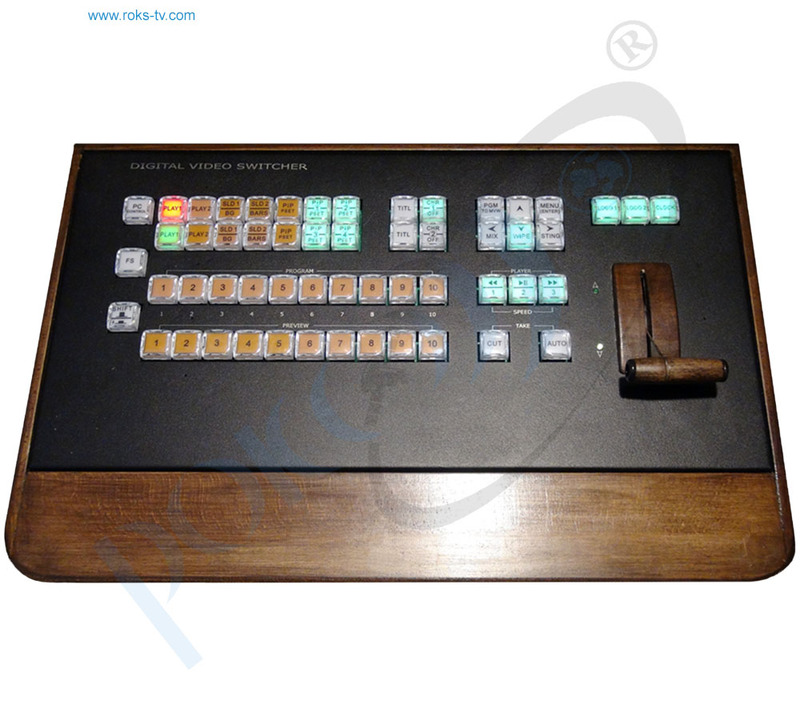 Video Mixer / Switcher HD could be used for live broadcast, show, presentation, interviewing as well as for video production at TV studios. The mixer is available in two versions: the first version is structurally designed in the typical for professional use form – main unit (the vision mixer) and control panel (the console). 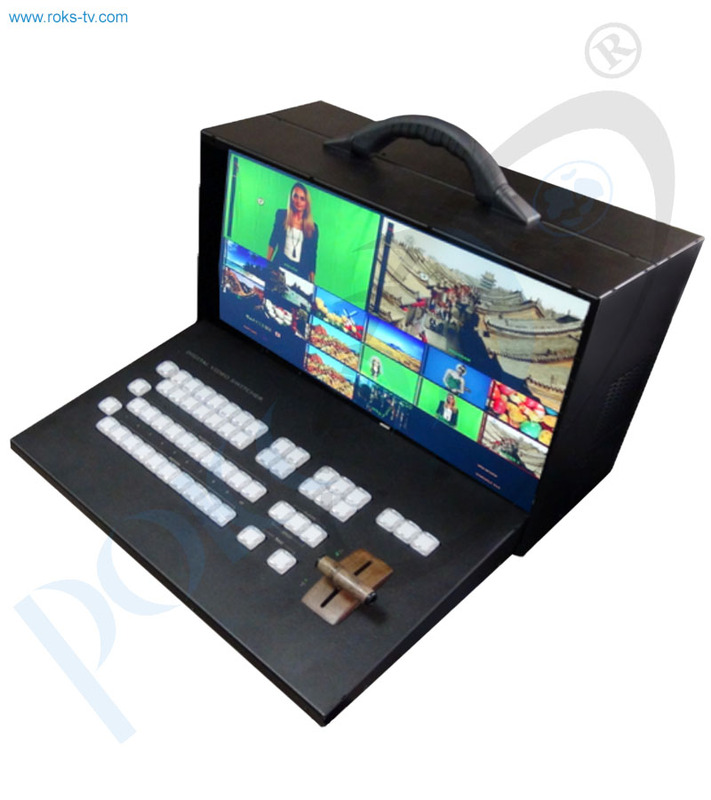 The second version - is the portable mobile video studio (both the vision mixer and the console is included in one case). 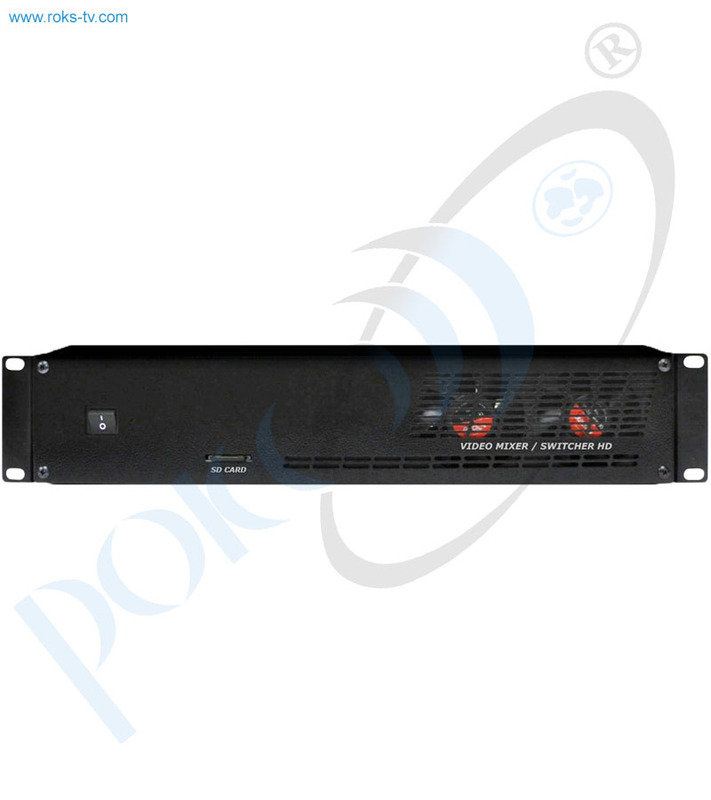 Physical Installation of the main unit is 2 Rack Unit Size. Built-in MultiView. The multiview output allows you to see all 10 inputs of video, 2 video players and 2 built-in still pictures on a single HDMI TV / monitor or SDI monitor! You can see all of your cameras, TALLY indicators, graphics, preview and final program output all on the same display at the same time. In addition, the Multiview has indications of the input and output analog and embedded SDI signals of the sound levels. Menu (OSD) can be displayed on the Multiview also. You can switch on and operate the menu (OSD) from the control panel. Picture-in-Picture effect (PiP). It is possible to enable the PIP presets, which are the combination of up to 4 windows included in the background. It is possible to change the following smaller windows settings: size, crop, edging color, border width, position, sources for smaller windows and for backgrounds). All settings of the PIP presets are made and stored in the "Switcher Contol" software from the PC. 4th PIP presets are written in the non-volatile memory of the switcher and saved during restarts. 4th presets can be enabled using the PIP1/PS1...PIP4/PS4 buttons. It is possible to change the sources in the PIP windows from the control panel, and quickly turn on or turn off the PIP windows either on the Preview or on the Program. Two independent Logos. 1 Logo can be dynamic. Total 8th logos can be uploaded from the PC in the vision switcher non-volatile memory and then to assign on independent buttons "Logo 1" and "Logo 2". 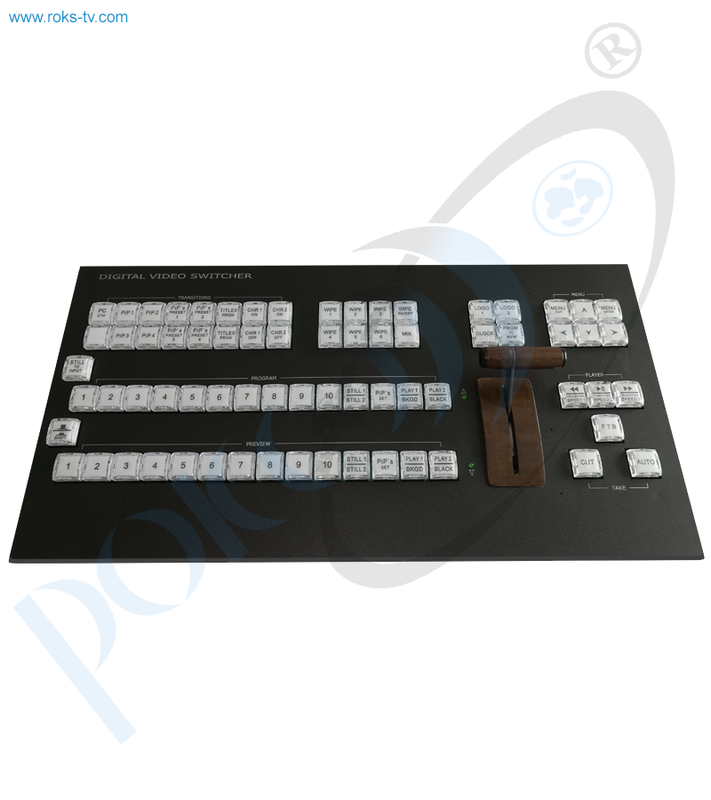 Each of the logos can be placed on the screen in any needed position using "Switcher Contol" software from the PC . Logos can be changed from PC and from console of the vision switcher. Each input has its own frame synchronizer, which allows you to use cameras or other devices that do not have Genlock as well as input video from computer sources (audio input signals also pass through the synchronizers). Video Mixer / Switcher HD has 4 analog audio inputs (XLR connectors) which can be configured as 2 stereo inputs or 4 Mono. Two built-in video players with high quality VC3 on the SD card. The possibility of playing video files and video playlists via HDMI inputs of the vision switcher. Built-in background color signal, including "Black" and "Bars", which are operated as independent sources and have the buttons on the Preview and Program lines on the control panel. Two built-in Still Pictures, which are operated as independent sources and have the buttons on the Preview and Program lines on the control panel (total of 32 still pictures can be stored in the vision mixer memory). The ability to include technological still picture on all inputs of the vision mixer. That is each of inputs can be switched to the still picture mode (for each input is set still picture). Built-in 1 kHz audio source with level 0, intended for testing and adjustment the level of sound channels. It accompanies the internal source color BARS. An additional HDMI output on which can be assigned any sources and Multiview. Two independent Chroma Key channels (with original automatic setting). 1 Clock can be switch on/off using independent button (clock can be placed on the screen in an arbitrary position using the “Switcher Contol” software from the PC). F/W Upgrade, upload Still pictures, upload Logo and Clock, control panel via Ethernet connection. Transitions: 6th WIPE special effects with reverse mode and Mix (for each effect button, you can independently set the width of the transition border, the border color and the transition speed). The possibility of adjusting the dynamic range for digital and analog audio. Input and output audio signals can be selected by the user with nominal levels -6, -12, -18, -24 dBFs (from the OSD menu). The possibility of assigning any input audio channels to any buttons of video sources (for example - one audio channel for 4 switchable video inputs). This mode is useful for working with an external analog audio mixer. The configuration is carried out via the PC. The ability to mix sound synchronous with video with a choice the type of sound transition - V or Y. The ability to assign the Multiview on any outputs of the switcher. It is possible to overlay the PiP presets and Titles simultaneously on the video output signal. The ability to assign signals from any inputs to all outputs of the vision switcher. Quick configuration are made directly from the control panel and the on-screen displayed menu on the multiscreen. The device configuration and rarely used settings are made from the PC only. It is possible to select the speed of the transition, including promptly from the control panel of the switcher. It is possible to remote control with "Switcher Contol" program (virtual control panel) from the PC. It is possible to choose with DIP-switch method of connection of the main unit and control panel. The 1-st method via RS-232. The 2-nd method via Ethernet connection. It is possible to connect a reserve +12В (9-15В) power supplier. Wireless or wired via Ethernet Intercom system for 4 users - optional. 4K Multiview (4 windows) - optional. Outputs 2 channels XLR balanced. Output SDI Embedded Audio-One Stereo-Pair (Group and Pair can be selected). Audio level adjustment Each audio source, including embedded and analog, can be assosiated with any or several video sources. "Audio follows Video" switching mode. Audio level control of the all inputs and master audio level output via On Screen Display Menu and PC Switcher Utilities. Buit-in Video Player Dual player (VC3) on SD card, 2 players work like 2 independent sources. Up to 256 Gb SD Card. Clip capacity up to 4 hours of a video content. Built-in Still-image 2 Still-images can be assigned on 2 independent buttons. Up to 32 slides can be uploaded from SD card (Slide 1/2), it works like 2 independent sources. Built-in Logo insertions and Clock 8 Logos (1 Logo is dinamic) and 1 Clock, up to 8 Logos can be uploaded from PC in the Video Mixer/Switcher memory and then asigned on independent buttons "Logo 1" and "Logo 2". Clock can be switched on/off with independent button.